It’s evident that change is afoot in Goodbye Deponia, the third and final game in a trilogy of hilarious point and click games by Daedalic Entertainment. Early on in the game we catch our first glimpse of the inside of the Argonon cruiser headed for Elysium. It’s people look relaxed and are enjoying the high life unaware of the fact that people still reside on the planet they are about to destroy. Rufus and his band of stragglers are not about to let that happen however, and even after all his mistakes Goal has come around to his way of thinking too. From the first moment you are able to take control of Rufus mayhem ensues, not in a frustrating ‘detrimental to the game’ kinda way, but in a wholly expected and welcomed ‘Rufus is back’ kinda way. If you’ve played the previous parts of the story you’ll already know that despite his best efforts everything Rufus touches is ruined in one way or another and the same is evident in the early story and puzzles of Goodbye Deponia. The game mechanics are much the same as you would expect from Daedalic’s past games and indeed the past Deponia games. Space bar highlights any interactive points on the screen where as the left and right mouse buttons allow you to examine, pick up and use items found on your travels. Considering that this is the final part of three games, I would have expected the puzzle solving to be as hard as ever. Instead during the first few moments you are almost on rails and have only one option to advance. This is soon sorted and the proper puzzle solving kicks off but while the intro is entertaining, it also seems a little weak as far as gameplay is concerned. As the version I am playing is only a preview and not the final product, there are still issues with sound balancing and missing text/voice from conversations. These are things that I would fully expect to be ironed out in the final product, but could cause frustration if they are missed. Aside from the obvious flaws, Goodbye Deponia actually seems to run a lot faster on my ancient laptop than the previous two games did. Again this could be because of the version but if translated to the final product this would improve gameplay and cutscenes nicely. Daedalic claim that Goodbye Deponia can be played as a stand alone, without knowledge of the past two games and while they certainly try I don’t believe that you would experience the game properly. Without having that previous knowledge of characters, running jokes and puzzle solving methods many items of information would go way over your head. There’s even a quick run down of the past two adventures, but this for me acted as a jog of the memory more than a serious explanation that would allow an uninformed me to continue with play unhindered. With all that being said the general feel of Goodbye Deponia is one of high quality care and attention, both in puzzle solving and game mechanics. The world, its characters and intricately hand drawn backgrounds are all still present and there is nothing to say that this wont be as good as the past two games, only time will tell. When all is said and done it really will be sad to say goodbye to Deponia and to Rufus, but at the same time I look forward to the conclusion of many hours of play and a genuinely interesting world. 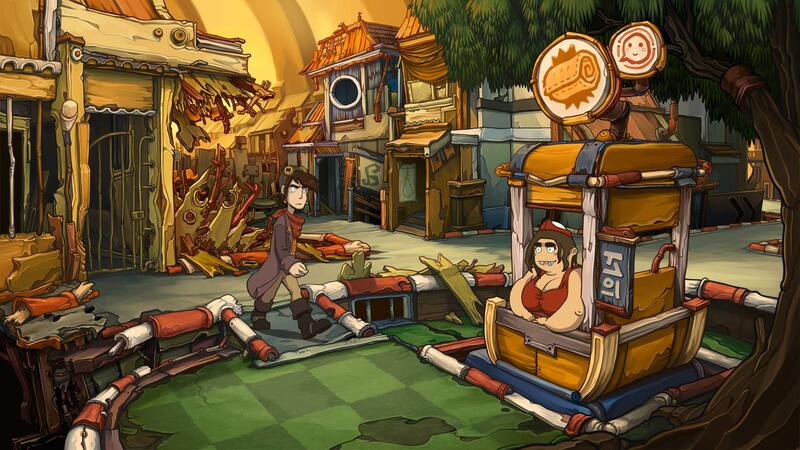 Goodbye Deponia will be released via Steam and other outlets on October 22nd.